This map has been put together with different resources. The town of Barnstable has documented their portion of the trail but very few others have. 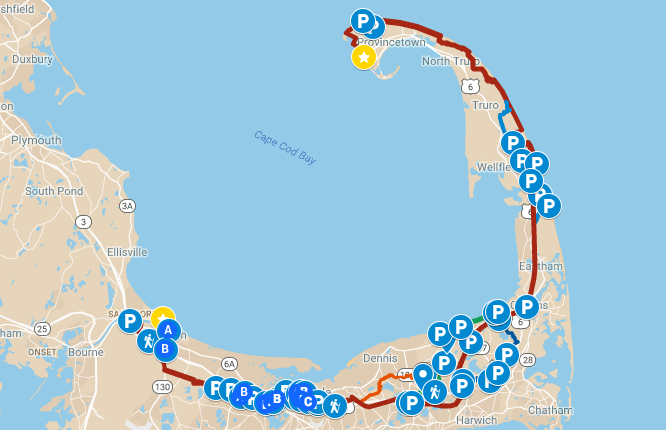 I read about or walked the other portions of the trail shown and have attempted to make a comprehensive map allowing someone to walk from one end of the Cape to the other. Walking the full trail is around 75 miles. Not all trails are official Cape Cod Pathways trails. “In 1993, the Barnstable County Commissioners hatched a plan to create a regional system of trails from one end of the Cape to the other. Dubbed the “Cape Cod Pathways,” the concept was to connect the Cape Cod National Seashore with the Cape’s wooded interior, historic villages, and remaining backcountry.” Excerpt from BLT site. Below are links about the Cape Cod Pathways project. Cape Cod Trails Conference explanation of how to walk Cape Cod.